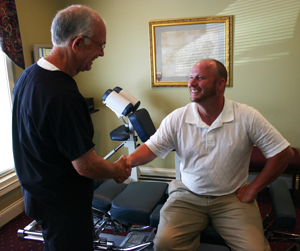 The Wellness Center, located in the Medical Arts building in Huntingburg, Indiana, has been providing quality chiropractic health care since 1979. In addition to chiropractic care the Wellness Center provides nutritional counseling and MLS laser therapy to the residents of Dubois County and surrounding areas. Call or visit us to find out how you can get relief from everyday aches and pains, carpel tunnel, numbness, migraines, autoimmune disorders, thyroid problems, and much more.